Sophia—a former child prodigy and 17-year-old math mastermind—has been having panic attacks since she learned that after high school, former prodigies either cure cancer or go crazy. It’s a lot of pressure. So Sophia doesn’t have the patience for games right now. She especially doesn’t have the patience to figure out why all these mysterious playing cards keep turning up inside her textbooks. Joshua—a highly intelligent and cheerfully unambitious amateur magician—has been Sophia’s classmate and has admired her for as long as he can remember. He thinks the time is perfect to tell Sophia how he feels. He doesn’t know how wrong he is. A long-awaited follow-up to Life in Outer Space, this heartwarming tale of unconventional romance, perfect timing, and finding your own magic is perfect for fans of Rainbow Rowell and David Levithan and anyone who believes in making friends with the freaks. Calling all nerds, geeks, geniuses, magicians, and lovers of YA lit! We're giving a away a finished copy of The Secret Science of Magic! Just follow us on Instagram and tag a friend in the comments of the giveaway post to be entered to win! Don't like your chances in the giveaway? 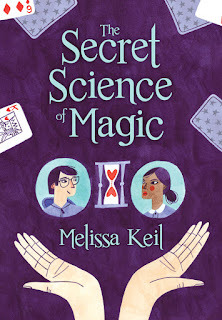 Pre-order The Secret Science of Magic today!